For many years, before having a depression self help strategy, I had stopped making resolutions in spite of my friends and family’s request to join their fun and excitement about this habit. I never seemed to achieve all that I wanted, and ended up disappointed by the time the next new year came and I was asked for a new resolution. Things have changed in my life, now that I ended my depression spin. I have also learned to set big goals, such as “Ending my Depression” but breaking it down in smaller steps, like following the treatments for depression list one at a time. This year I have one resolution. 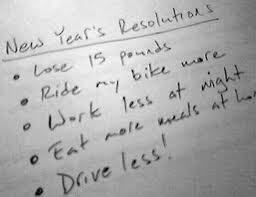 To finish my resolution one day at a time. Making goals achievable is the best way to make them come true. Starting small enough, and finishing them, makes you feel good, and it’s good for you. We all need that sense of achievement to keep us going, and motivate us to achieve the next step. We often make large goals but fail to brake them down into smaller steps. Set your overall goal to "End depression", and live healthy and happy. Then follow the treatments for depression one item at a time. Take the time to do and practice every one of the steps. Set yourself a goal to finish them once a day; or once a week. Make it achievable within your schedule. Follow our website for your health, wealth, and happiness.